1) Breeders/Exhibitors are not sanctuaries. In addition to not being a sanctuary because they breed and do offsite exhibits, these people who claim to love animals so much typically operate facilities where the animal care, while it may comply with USDA’s minimal standards, is far below the standards set by GFAS as humane, and in many cases is deplorable. 2) Life on the road means being torn from mother, denied natural behaviors, and mistreated. The cubs used for petting exhibits are torn from their mothers shortly after birth, causing emotional pain to both the cubs and the mothers. Imagine what that mother tiger experiences after enduring the long pregnancy and finally giving birth, filled with the instincts to nurture her cubs, and then having them snatched away. The breeders take them away and have people handle them so the cubs will “imprint” on the people instead of doing what is natural and imprinting on their mothers. And what is life like during the months they are used to make money for their owners? Cubs this age want roam, explore, test their young muscles to develop coordination, and sleep for extended periods of time without interruption. Watch what happens during these exhibits. The cubs are repeatedly awakened so a customer can pet them instead of being allowed the sleep their young bodies need. When they try to wander they are repeatedly yanked back. And where are they when not on exhibit? 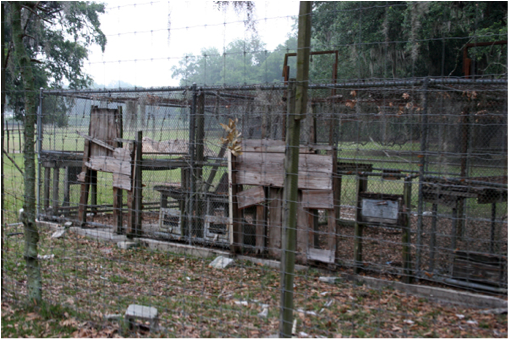 They spend endless hours in small cages in trucks, hardly a suitable environment for inquisitive, active young cubs. While used for petting by the public or held for photos with the public, the cubs squirm and try to get away. What do the exhibitors do to control them? One technique used by exhibitors to get the cubs to stop squirming is blowing in the cub’s face. Contrary to what the exhibitors say, this does not “calm” the cub. The cub does not like this any more than you would. This blowing in the face is a way mother tigers discipline their cubs. It is a punishment. The cub becomes inactive temporarily not because the cub is calm. The cub becomes inactive hoping that not moving will cause the exhibitor to stop blowing in its face. The other technique is to dangle the cub from under their front armpits and toss them up and down in the air. One notorious exhibitor tells customers this is to “reset” the cubs. Another tells customers that this is how the mother tiger holds the cubs, which is equally ridiculous. Being held under the arms and tossed up in the air is just another unnatural and unpleasant experience that causes the cub stress, making them temporarily stop doing the behavior that is natural, i.e. trying to squirm away from being held. What happens when the cubs are sick? The video at www.TigerCubAbuse.com shows cubs with severe diarrhea kept on display. The keepers simply follow them around wiping diarrhea off the floor, and then use the same towel to wipe the cubs’ irritated rear ends as the poor cubs scream in pain. How would you feel if you were their mother and knew this was the life they had been torn from you to endure? 3) Cubs are routinely used to make money both below and above the legal age. While cub displays are inherently cruel for the reasons given in this fact sheet, USDA regulations do allow them, but only for a few weeks. USDA has ruled that there should be no public contact with the cubs until they are at least 8 weeks old because that is when they receive their first injections to prevent disease. USDA has ruled that there should be no public contact after the cubs are 12 weeks old because they are large enough to be dangerous. So, the only time it is “legal” to have the public pet cubs is when they are between the ages of 8 weeks and 12 weeks. However, because enforcement resources are limited, exhibitors flagrantly violate these rules, putting the cubs and the public at risk. Videos at www.TigerCubAbuse.com and www.TigerCubAbuse2.com show exhibitors freely admitting on camera that the cubs are under 8 weeks old. The video at http://www.youtube.com/watch?v=tE8CXQLKfq0 shows people playing with 5 and 7 month old cubs at G.W. Exotic Animal Park, home base for Joe Schreibvogel and Beth Corley, who operate the most notorious mall exhibit road show. Twenty-three of this exhibitor’s cubs died in 2010. 4) Abusing cubs is not a necessary or justifiable way to make money to support adult cats. The exhibitors often claim they have no choice, that they must breed and exploit cubs to make money to support their other animals. Joe Schreibvogel posts on Facebook “I don’t think none of us like to be forced to be in the entertainment of animals (sic).” But the truth is that true sanctuaries all over the country support their animals without abusing some in order to make money to feed the others. They do this by providing a great home for the animals that far exceeds the minimal legal requirements and then learning how to attract donors who appreciate the excellent home they are providing. Lacking the ability to do this is not an excuse for abusing tiger cubs to make money. People who are not capable of operating a real sanctuary simply should not own animals. No true animal lover could justify abusing some animals to provide financial support for others. 5) Paying to pet tigers does not support conservation in the wild. No money the public spends to pet or take photos with tiger cubs ever goes to support conservation in the wild. In fact, the opposite is true. 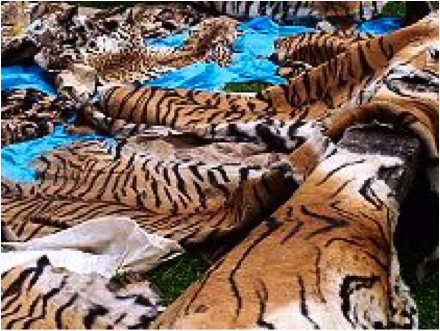 There is a huge and growing market for tiger parts like the skins pictured here, and tiger “derivatives”, i.e. products made out of tiger parts like tiger bone wine. A dead tiger is worth up to $50,000 for its parts. Breeding what US Fish and Wildlife Service calls “generic” tigers like the ones used in the mall exhibits is not tracked. So there is no way to know how many U.S. born tigers are killed to have their parts illegally sold into this trade. And, the more that trade expands, the more incentive the poachers have to kill tigers in the wild. 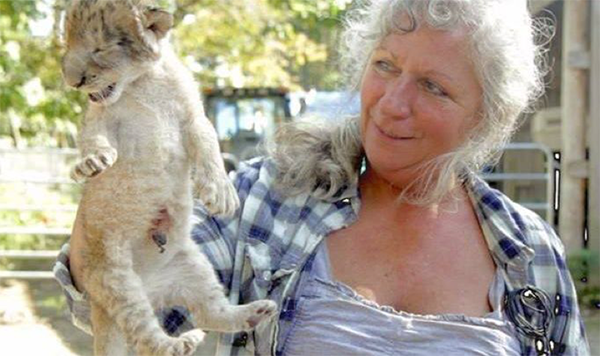 6) Petting cubs sends the wrong message about exotic animals as pets. Exhibitors often claim that they are teaching people that exotic animals should not be pets. But what example do they set as they handle the animals and let others do so? Saying that exotic animals do not make good pets while charging people to pet them is a little bit like someone telling people not to use heroin while having a needle sticking in their arm. “Do as I say, not as I do” is not a message that works. The websites of these exhibitors frequently show photos or videos of the exhibitor handling, hugging or kissing adult tigers. This encourages other people to want to be “special” like the exhibitor. The way to encourage people not to want exotic animals as pets is to set an example by never having physical contact with them. This is what true sanctuaries, people who truly care about the animals, do. Meantime, exhibitors like Joe Schreibvogel actively support of private ownership of exotic animals as pets. 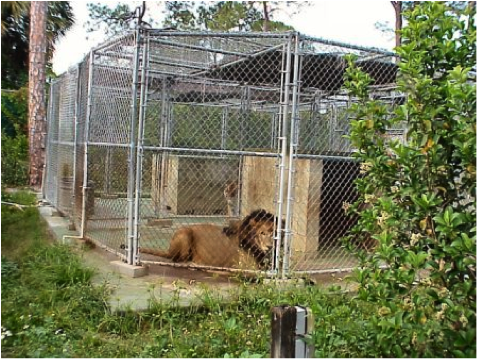 He has conducted a fundraiser for an organization devoted to, “fighting for the rights of everyday people….to keep, house and maintain exotic animals”. Schreibvogel’s 2010 fund raising event was attended by people who brought their pet primates. 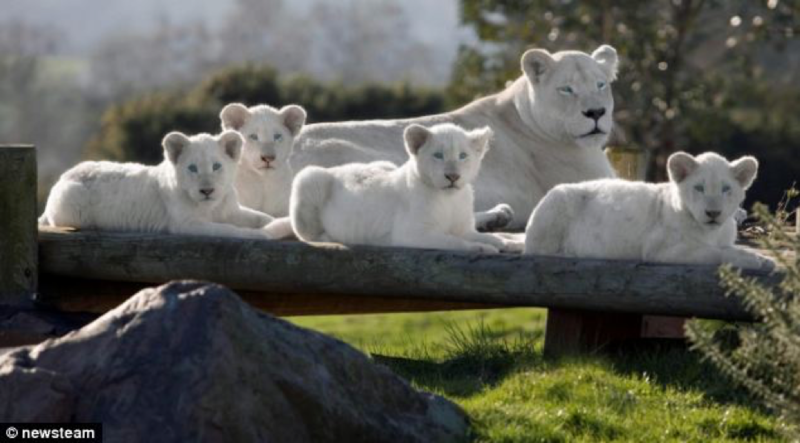 He created an “association” whose website has a page offering baby white tigers for sale. Many of the followers on the “Joe Exotic” Facebook page are obviously exotic pet owners. The G.W. Exotic website actively rails against the steady trend of laws banning private ownership to protect the public and stop abuse of the animals. Private ownership of exotic animals results in widespread abuse as cute young animals mature and end up being kept in deplorable conditions. While some exhibitors claim they are teaching people not to get exotic animals as pets, others actively promote the trade. But all of them, by their behavior, encourage people to own exotic animals in order to be one of the “special” people who can have contact with these animals. 7) The cubs are destined for a horrible existence after they are too big to use to make money. This is the single biggest reason not to permit cub displays. If asked, exhibitors tell venues and patrons that the cubs will end up in some wonderful home, either at their facilities or elsewhere. 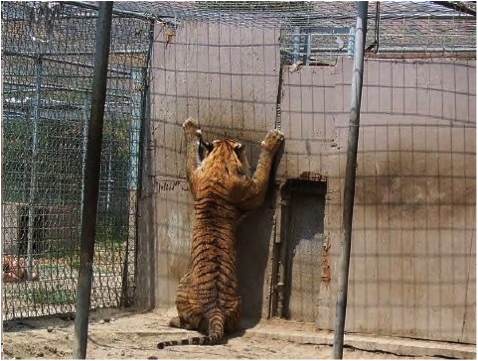 Current USDA rules allow an owner to keep a tiger in a concrete floored, chain link jail cell not much bigger than a parking space, often with nothing to do but walk in circles or stare out. 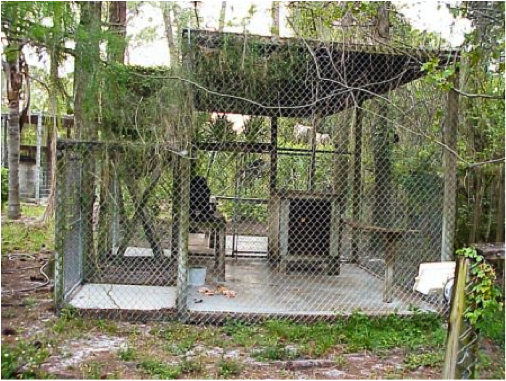 Enforcement of the rules that do exist is limited because it would be economically unfeasible to have enough inspectors to adequately monitor the thousands of tigers owned by people licensed by USDA to exhibit animals. These are animals built to live in the wild, roaming and hunting. They are very intelligent and they experience a broad range of emotions. We treat criminals in prison far better than the way most owners end up treating captive tigers, whose only crime was being bred by a breeder/exhibitor to make money. Attached are photos that are not exceptions. They are typical of the conditions in which the cubs that are bred by private owners will end up. Changes in values in our society do not happen suddenly. It took decades of educating and changing people’s minds before women finally got the right to vote, something we take for granted today. A similar progression occurred in the area of civil rights. The same shift is taking place at an accelerating rate with respect to our society’s view of private ownership of big cats. Compelling evidence of this is found in the trend in state laws. Just since 2005, eight more states have banned private ownership of big cats, generally recognizing that such ownership is dangerous to people and results in the animals being kept in deplorable conditions. Many people innocently support the abuse by patronizing the cub displays. The cubs are adorable, and the exhibitors are skilled at telling their lies. But, increasingly numbers of people are aware of the issues presented in this fact sheet, or on their own simply see the displays and find them repellant. As the number of people of people who find such displays objectionable grows, venues like malls increasingly make a negative impression on patrons in a way they cannot necessarily measure. Venues like Petsmart stores, Alton Square Mall in Alton, IL, and Metro North Mall in Kansas City, MO have led by banning exotic animal displays. As more and more people become aware of what happens “behind the scenes” and actively object to the cub displays, more and more venues will ban the displays. In the meantime, venues who allow the displays make a negative impression on many customers who care about animals while many tiny cubs are condemned to lifelong misery. As a venue, you can make a wonderful contribution to society by helping stop this abuse, while at the same time sending a very positive branding image to the many customers who love animals and do not want to see them being abused when they come to shop. We hope the information in this fact sheet is useful. If you have any questions, please feel free to contact Susan Bass, Director of Public Relations at Big Cat Rescue in Tampa, Florida at 813-431-2720 or Susan.Bass@BigCatRescue.org. Venues that these exhibitors lie to in making their pitch to be allowed to display have a critical choice. They can be part of the problem, encouraging this abuse by permitting it, or part of the solution. We hope you will send a positive public relations image to your many animal loving patrons and help save these innocent tigers from abuse by banning such exhibits in your venue. 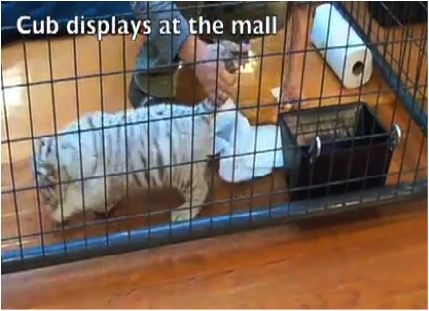 Get the brochure to hand out when you see cub abuse at malls, fairs, flea markets and schools.